1. 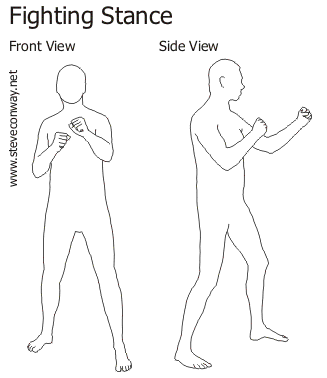 Always, Always Always try to twist your hips and lean forward with you punches and upper body strikes. This alone will lead to unprecedented power. 3. Aim kicks to the lower parts of the body. 4. Truly, all power comes from foot work. 5. When stepping forward to strike, your strike should shoot out the exact moment your foot hits the ground. 6. To begin any form of a strike, you must: (1) Chamber your "weapon"; (2) Strike; (3) Recoil and bring the strike back, as leaving a strike out can leave you open. 8. Live side- Inside of lead foot. Lead punch:punch with leading hand. Used primarily as a opening or leading punch. Should be extremely fast. Reverse punch:punch with non-leading hand. Upper elbow: Reach up in a fashion like a cowboy drawing a pistol, then bring your hand back to your back, resulting in a devastating strike. kick: attack using foot or leg. Kotogaeshi: someone grabs you. then you take their wrist and bend it toward the outside of the arm while fluidly moving your hips, waist and legs. Armbar:put arm straight so that the non-bend part of the elbow is upward. take wrist and bend it up. pull up on wrist while pushing down on the elbow cap. Shoden: put elbow against your chest and take the knuckle side of their wrist and push in toward elbow while pushing out the elbow.